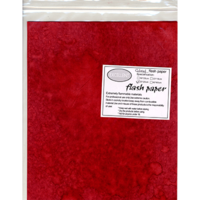 Today, when you order "Flash Paper five pack(25x20cm) Red", you'll instantly be emailed a Penguin Magic gift certificate. You can spend it on anything you like at Penguin, just like cash. Just complete your order as normal, and within seconds you'll get an email with your gift certificate. I have up until ordering the red flash paper only used white. I love the red and will probably order blue in the near future. It better hides things you are attempting to vanish when paper is lite. Great product! This paper provided exactly the intensity for the trick we did on stage. It was safe, easy to work with and had a vivid color.